Six sea (or nautical) miles from the coast of Gansbaai, quite close to Dyer Island and Geyser Rock, a great white shark breaks through the water surface. Its dorsal fin cuts through the water. The dorsal fin can be seen quite distinctively. It is an individual, special feature of recognition of the shark, unique and unmistakable. 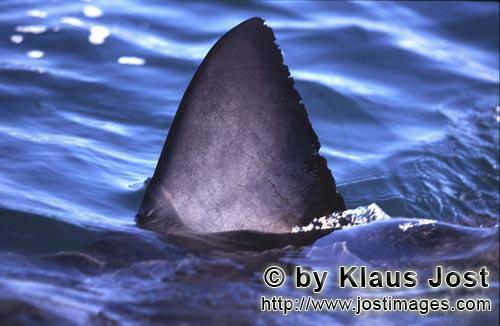 Following the article, which appeared in the edition of „Wissenschaft” on 20th August, 2004, US biomechanics have deciphered the use of the rakish shape of the shark fin. The dorsal fin and also the tail fin with its asymmetric composition ensure the mobility of the shark. The researchers analysed the swirls of current (high-speed camera), created in an upward motion by the enlarged fin. “The current conducts the water simultaneously backwards and downwards”, as explained by Cheryl Wilga and George Lauder from the Rhode Island University. “In this way the vertical manoeuvrablility is increased.“ With fishes with symmetrical fins, swirls of current are formed around a rotational axis, however the shark allows the water to flow in a more complicated way. Two swirl centres layered above each other stabilise it with sideways (or lateral) and vertical movements (Wissenschaft 20/08/2004).